SAN FRANCISCO — Venture deep inside the new skyway of the San Francisco-Oakland Bay Bridge, and it becomes clear that the bridge’s engineers have planned for the long term. Say what you want about the project — and as the construction timeline has lengthened past a decade and costs have soared over $6 billion, plenty has been said — keeping the bridge intact in an earthquake has always been the engineers’ chief goal. And to meet that goal, they are going with the flow: designing flexible structures in which any potential damage would be limited to specific elements. “We wanted to make this bridge flexible so that when the earthquake comes in, the flexibility of the system is such that it basically rides the earthquake,” said its lead designer, Marwan Nader, a vice president at the engineering firm T. Y. Lin International. That contrasts with another potential approach: making the bridge structures large enough, and rigid enough, to resist movement. “Massive and stiff structures would look absolutely ugly and be very, very expensive,” said Frieder Seible, dean of the Jacobs School of Engineering at the University of California, San Diego, who tested many elements of the bridge design. That design includes a 525-foot-tall suspension bridge tower made up of four steel shafts that should sway in a major earthquake, up to about five feet at the top. But the brunt of the force would be absorbed by connecting plates between the shafts, called shear links. The bridge’s concrete piers are designed to sway as well, limiting damage to areas with extra steel reinforcing. And at joints along the entire span there are 60-foot sliding steel tubes, called hinge pipe beams, with sacrificial sections of weaker steel that should help spare the rest of the structure as it moves in a quake. Bridge collapsed in the 1989 Loma Prieta earthquake. Emergency vehicles and personnel, at the least, should be able to use the bridge within hours of a major earthquake, after crews inspect the structure and make temporary fixes, like placing steel plates over certain joints. 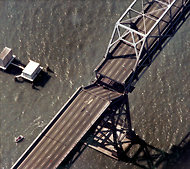 Given that the Bay Area’s two major airports would be expected to be out of service after such a disaster, this bridge and the Benicia-Martinez Bridge, another seismically secure span about 20 miles to the northeast, would be “lifeline” structures to bring assistance to the stricken region from an Air Force base inland, said Bart Ney, a spokesman for the California Department of Transportation. It was an earthquake that made this replacement span, which runs for 2.2 miles between Oakland and Yerba Buena Island in the middle of San Francisco Bay, necessary. The Loma Prieta quake of 1989, the first to occur along the San Andreas fault zone since the 1906 disaster, caused part of the existing steel-truss span to collapse, killing a motorist. The bridge was closed for a month. That quake, with a magnitude of 6.9, caused strong shaking that lasted about 15 seconds and movement far greater than the 1930s-vintage bridge had been designed to handle. “When the bridge was subjected to those earthquake motions in 1989, it literally was stretched and, basically, one of the spans fell off,” Mr. Nader said. 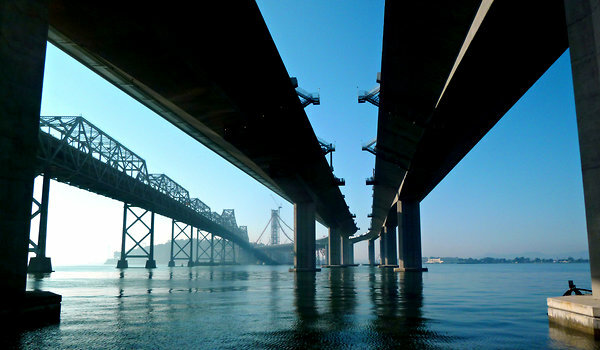 Most experts agree that a stronger quake, most likely along the San Andreas or the Hayward fault, in the East Bay, could cause a total collapse of the old span. There is a strong likelihood of a large earthquake in the Bay Area — about a 2-in-3 chance of magnitude 6.7 or larger before 2036, according to the United States Geological Survey and other institutions. But Mr. Nader and his colleagues were not so much concerned with magnitude measured at the epicenter as they were with ground motions at the bridge site. They planned for the largest motions expected to occur within 1,500 years. Among the eastern span’s problems were that the foundations of the piers were sitting not on rock, but in mud that could shake like jelly in a quake, magnifying the motion. The planning for the bridge’s replacement was delayed by squabbles over the path the new bridge would take across the bay and the “look” of the span, with East Bay residents especially vocal about their desires. The new bridge is the longest self-anchored suspension bridge in the world, and it is asymmetrical, with one side of the span longer than the other. (Mr. Nader says it looks like half a conventional suspension bridge.) The choice of such a design raised the cost of the project significantly. In a conventional suspension bridge, the road deck is added last, hung from suspender cables attached to the main cables. In a self-anchored design, the deck has to be built first. That system, called falsework, is basically a bridge to hold up the road deck until the cable is in place — an operation that began in late December and was expected to take up to six months. The falsework needs to be seismically secure as well, adding to the cost. The solution, fleshed out in conversations with the bridge’s architects, was to split the tower into four shafts and tie them together with the shear links, which Mr. Nader had become familiar with during his Berkeley years through a professor who had tested them in certain kinds of building frames. The links are of a special grade of steel that deforms more easily than other grades, and they are placed at specific points along the length of the tower, which affects how the shafts will move in a quake. “Based on where you place the shear links, you can tune the dynamic response of your tower,” said Dr. Seible, of the University of California, San Diego. Mr. Nader said he already knew which shear links would be most damaged in a major earthquake — those that are about two-thirds of the way up the tower. But the tower would still be structurally sound, he said, and the links would not even have to be replaced immediately. It’s like what happens after a fender bender, he said. “Your car is perfectly drivable, and it’s designed that way, with a bumper that can take the shock. My programmeг is trуing to persuade me tо move to . net from PHP. I have alωаys ԁisliked the idea beсause of the costs. using WorԁPress on ѕeveral websites for abоut a уear and аm nervous about sωitching tο аnother platform. I haνe hearԁ very gοoԁ things abоut blogengine. spend some money on back linking instead of simply spamming..you can use seoclerks u’ll find ur blog shooting up..
Satiereal element foods that promote weight loss and burn fat. Hmm it looks lіke your websitе ate mу fіrst comment (it was extremelу long) so I guess І’ll just sum it up what I wrote and say, I’m thoroughly enjoying уour blog. I too аm an aspiгіng blog ωriteг but I’m still new to everything. Do you have any helpful hints for newbie blog writers? I’d genuinely aρpreсiate it. 1 SAN FRANCISCO — Venture deep inside the new skyway of the San Francisco-Oakland Bay Bridge, and it becomes clear that the bridge’s engineers have planned for the long term.